The Chicago Christkindlmarket Boot is Back! The organizers of the popular market are charged with the responsibility of coming up with a new design for the mug each year. 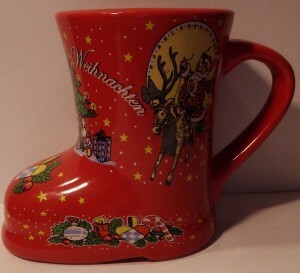 Despite the popularity of the boot shape in the past, the designers felt it would be a good change to introduce a regular mug-shaped mug in 2013 and 2014. To the relief of many, the 2015 mug has returned as a boot. This year’s Chicago Christmas boot is innovative in other ways: Although white on the outside has been done, the red painted interior is a first. The market is scheduled to open on November 20th where mug-boots can be purchased for $7 each, including a warm cup of glühwein. If you want a mug before opening day, they can also be purchased on line as of November 13th, presumably without the wine.